lead our pack to greatness. She would handle all the decisions now. All we need do was just follow her leadership and we would all be happy puppies. As existing pack leader (and just barely hanging on to the role as it was), I took exception to the views of this young upstart. Emma was born to lead. I was not born to follow. The following year was an uphill struggle (if I had a dollar for every time I rolled her and snarled "I am ALPHA in this pack", I could buy myself a submissive dog). Through constant (and often embarrassing) reinforcement of my role as leader, I slowly got my point across. The males stayed clear - this was an estrogen to estrogen clash of wills. Fortunately, I enlisted the aid of an alpha female from another pack. Pam, a professional dog trainer, gave me the edge I so desperately needed to retain my seat as pack leader. Without her help, we’d all be doing Emma’s bidding. Still, Emma was a worthy adversary and from our struggle came a respect for each other’s skills and determination. She was an intelligent - often devious - opponent, but she finally accepted that I, too, had a few tricks up my sleeve. 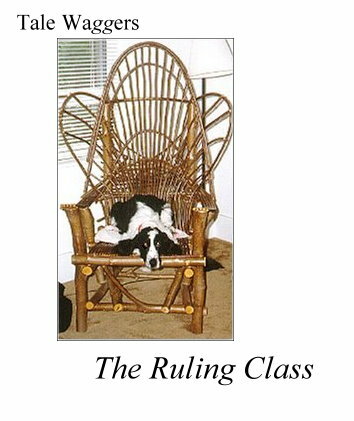 The problem with "ruling class" dogs is, while they may eventually submit to your leadership, they still like to have some control. They are smart and devious - and their need to dominate is huge. Now, we might have settled the matter by giving Emma meaningful work to do - something along the lines of agility training maybe. Her natural need to be in charge could have been blunted by constant activity. We didn't have the time and energy for that. Instead, we’ve settled into a bizarre compromise. I make the decisions and Emma enforces them. If I call Arthur, Emma will bring him in. I mean this literally. She gets his attention by charging him, then she herds him into the house. Once, on a freezing Winter night, she went so far as to grab him by the collar and drag him up the ice-covered sidewalk to the door! As I watched in shock, she then dragged his poor old bones up the two steps and deposited him on the landing. She was just beaming with joy. We had a stern talk about her methods… but Arthur doesn’t dawdle anymore. When he sees Emma streaking toward him, he makes a beeline for the door. Little Duncan also found her methods infuriating. Whenever I called, she tackled him. He was too small to herd - he kept walking between her legs. He was too wiggly to drag. Her solution was to hold him down till I came out to collect them both. As he grew, she switched to her herding methods. Now, almost grown, Duncan too makes a mad dash for the door before Emma can tackle him. Emma knows the household rules so well we call her "The Enforcer". When I hear Emma barking, I know luckless Arthur has been caught with his head in the toilet or the trash. She’s even caught Duncan piddling on the floor and sounded an alarm. She loves to discipline - it’s her true calling. Now, I’m a lazy leader and I know a good thing when I see it. We’ve been trying to break Arthur of the revolting habit of eating dog droppings for years. We’ve tried internal and external methods (the neighbors watch in confusion as I season dog piles with various spices, hot sauce and soap). Nothing works. But now, I have a secret weapon. I have "Emma - the Enforcer". As Arthur begins to consume his disgusting snack, I yell "Bad Dog!" and Emma charges over and grabs him by the collar. It’s hard to eat anything when you’re being choked by your leader’s little toady. We’re making progress, but with Arthur we never really win. He now asks to go out about 20 times each evening - knowing full well that Emma doesn’t like to go out at night. If she stays inside, he is free to forage for "forbidden fruit". Still my "secret weapon" is keeping him on guard. Strange but true - We’ve finally channeled Emma’s bossy tendencies into a force for good. Along the way, I’ve learned, once again, that dogs will be dogs. When you share your home with a dog, you form a pack - plain and simple. The more you understand about how a pack works, the more likely you are to come out on top in the struggle for leadership. Emma’s puppyhood sparked a review of every dog behavior and training article I could lay my hands on. There are numerous opinions, methods and training programs. The most important thing is to find a reasonable, humane and effective program that works for you and for your dog. At the first sign of trouble, find a trainer you trust and let him/her evaluate your relationship with your dog. I’ve heard many times, "we can’t take food from him", "he growls at the kids", "she nipped me when I picked her up". These are warning signs that you are not really the leader of your particular pack. They are indicators of more trouble to come. I suspect many of the dogs euthanized for biting or behavior problems are just dominant dogs who were allowed to think they were in charge. Dominant dogs seize control…unless you take charge first. In another home, Emma might have ended up dumped at the local pound, or out on the road, or worse. Sad but true, I was once on the verge of returning her to the breeder myself. Fortunately for all of us, we were willing - and able - to get professional advice and follow up with consistent, persistent training. It's a struggle - establishing yourself as a fair, just and intelligent leader. Convincing your dog that you really are the best choice for pack leader is a hard sell. If you have a naturally dominant dog, it’s an ongoing battle. Still, it’s the best investment you’ll ever make, because the "ruling class" is really something - when you get to know them. Dog Training Basics written by Pam Young, who helped me win the "battle of the Emma" with no casualties on either side. For hands-on help, ask your vet or breeder to recommend a skilled trainer. ...You'll be glad you did!